This post is sponsored by Taste of Home in conjunction with Blog Meets Brand, and I have been compensated for my participation. All opinions are my own. When it comes to weeknight dinners, the saying, “If you fail to plan then you plan to fail” is absolutely spot-on. Raise your hand if you’ve found yourself in a fast food drive-thru on a Wednesday night because you started thinking about dinner at 5:30 and all the meat in your home was frozen solid and/or you were missing one key ingredient for pretty much everything you could think of that would come together quickly. My hand is high in the air, friends. I’m guessing yours is, too. We all know that creating a menu for the week is smart, but even that task can take quite a while to accomplish (I usually head to Pinterest looking for recipes and then get totally lost in DIY ideas and other life hacks and run out of time before I’ve found what I was originally looking for!). I’ve also found that I often will put together menu ideas that sound fantastic, only to realize when it’s time to start cooking that the recipes are much more complicated than I thought (I can’t even count the number of times I have been working through a recipe that I expect to be feeding my family 30 minutes later, only to find, “marinade the meat overnight” in the directions. UGH!!!!). And this is why I’m really enjoying a brand new cookbook put out by Taste of Home called The Simple & Delicious Cookbook. It contains a whopping 1,347 different recipes that perfectly fit the needs of my busy schedule as a working mom who is also the head chef at home. Within the book, many of the recipes have large, color images next to them. But what I LOVED seeing was that at the very front of each section, every single recipe has a small color photo shown, which means you get to see everything in this book! That’s a rare thing to find in a cookbook, and especially at this price point. I’ve been using this cookbook quite a bit since school started back as I have to really stay on top of the dinner plan in order to ensure that the kids’ homework gets finished and we eat something that is nutritious and that everyone will enjoy. The Simple & Delicious Cookbook is full of exactly what I’m looking for and since it’s all in one place, it keeps me from getting distracted online or from selecting recipes that are too complicated. The spinach & bacon salad with peaches (found on p. 259) was absolutely beautiful and easy! I cooked and crumbled the bacon in the morning and that helped this recipe come together lightning fast at dinner time! Another big hit was the maple sausage skillet (p. 92). The onions, peppers and mushrooms became completely irresistible once I added a small amount of maple syrup. I have made similar meals to this, ingredient-wise, but it’s never occurred to me to add maple syrup. It tasted fantastic!!! And for Taco Tuesday last week, we went in a new direction and had Thai Chicken Tacos (p. 59). I loved having a brand new idea for taco night and being able to introduce a different flavor profile. I also love that this recipe called for a rotisserie chicken, as taking a cooking shortcut like that can save you a ton of time (and I also think rotisserie chickens are a bargain…they usually don’t cost much more than an uncooked whole chicken!). I’ve even been able to find some fun special treats for after school (my kids come home positively ravenous most days so I’ve got to be ready for them!). I made caramel heavenlies (p. 467) and we all immensely enjoyed them! They came together really fast and just needed time to cool down before being served. It’s even one your kids would love to help make! If you are struggling with weeknight dinners or with avoiding the drive-thru, I highly recommend checking out The Simple & Delicious Cookbook. With so many recipes being offered, you could reject 2/3 of them and still have enough recipes ideas to provide a recipe each day for 1 year and 3 months with no repeats. And if you try them all? Well then you’ve got enough recipes in here to try one new thing each day for 3 years and 9 months. All for less than $20. That’s a no-brainer, if you ask me! Do you ever try to pull together a dish from random items in your fridge and freezer that are languishing and that REALLY need to get used up? This is exactly what I was doing earlier this morning. I spied a Pepperidge Farm puff pastry wasting away in my freezer, frankly taking up valuable real estate with absolutely no plans for being used. I wanted to change that, and fast. At the same time, I had an avocado that was threatening to spoil (you know how they are…they are ripe for approximately 6 minutes). Then I started digging around in the fridge and I found a few pieces of bacon wrapped up from breakfast 2 days ago that we’d forgotten about, an opened jar of salsa and some cream cheese. Look how beautifully these misfits played together! So here’s how you can create this savory puff pastry recipe in your own kitchen. Now cut the pastry dough into 9 squares (I had 3 rows of 3). Then cut each square on the diagonal to make triangles. Use the other triangle next to the piece you loaded to serve as the top, and using your finger, smoosh the edges together to the best of your ability. You want as much of it closed as possible. Some will likely stick out. It’s not a big deal, so don’t stress over it! I will say that trial and error taught me that it’s better to smush your cream cheese and avocado a bit on the puff pastry to make it not so tall. It’s not as pretty, but I think it’s less stressful to build that way. Once you have your 9 little pies made, dip them, one at a time, in the beaten egg, which is your egg wash, and then place them on the parchment paper. I hope this gives you some inspiration for a simple puff pastry recipe you can pull together. You’ll look like a professional chef making something so fancy, and nobody has to know that you were just trying to use up some leftovers! Chocolate Oatmeal Recipe for Busy Mornings: Monkey Business! For me, the early morning is a really important time, as it helps me set the tone for the day. I wake up before everyone else in the house, and I do this intentionally, so that I can have some iced coffee in peace and quiet, look over my tasks for the day and prioritize them, and give some thought to the meals we will be eating that day. If I wake up at least 30 minutes before anyone else, I can prepare breakfast from scratch (muffins, for example) or get the ingredients laid out for a green smoothie. But some days getting extra sleep wins and I find myself “sleeping in” until 5:30 or 6:00 when one of my little early birds wakes me up. On those days, there’s not as much time to give to meal prep, so I need something fast. But my girls have a full day of growing their brains ahead of them at school, so I still want to make sure that I give them a nutritious breakfast, even if it needs to come together quickly. Today I want to share with you a chocolate oatmeal that you can make in about 3 minutes and that is enjoyed by the girls so much that they lick their bowls once they’ve eaten everything. We call it “monkey business oatmeal.” I hope you enjoy it! The secret ingredient that really brings some great chocolate flavors is Carnation Breakfast Essentials®. If you struggle with pulling together nutritious breakfast offerings due to time, this is SUCH a great strategy to try! You can find Carnation Breakfast Essentials® in the cereal aisle of your nearest Walmart. By adding a packet to a cup of milk, you can make a better breakfast for your crew without having to take up any more of your time. Love it! So let’s make this monkey business oatmeal, shall we? After you have your ingredients together, first add your Carnation Breakfast Essentials® to the cup of milk and stir to combine. Now it’s time to add your drink mix to your oats (make sure they are in a microwave-safe bowl). Give it a good stir and then microwave according to the directions on the quick oats (mine said to microwave for 2 minutes). Once your oatmeal is cooked and cooled off just a bit, slice 1/2 of a banana into small slices and arrange around the bowl. Now your final product tastes great AND looks great! I want to encourage you to try eating healthier breakfasts for 7 days with your family. This chocolate oatmeal recipe is a great start! If you have folks in your crew who are used to skipping breakfast altogether, and who you don’t think will be ready to sit down to a bowl of oatmeal, try the Carnation Breakfast Essentials® Ready-to-Drink bottles. You can hand one off to that member of your family before s/he heads out the door (and they also make a super yum after school snack, too!). Having a healthier breakfast will provide lots of great rewards to your family, but if you need some additional incentives, the Carnation Breakfast Challenge has daily missions, and entrants can complete them to win great prizes! My family is going to be taking the challenge, and I feel confident that we can participate because we have great options for busy mornings, as well as for the mornings when mom has a bit more time to plan. Want some more inspiration for a breakfast makeover? Head to the Carnation Breakfast Essentials® Facebook page to get some ideas, and then remember to enter the contest! This post brought to you by DairyPure Milk. The content and opinions expressed below are that of Stuff Parents Need. I don’t know about you, but this is the time of year when I feel utterly at war with my to do list. Every morning I get out of bed and prepare for battle with a list that seems to get longer despite my best attempts to slash it. There just seem to be more needs than I can possibly fulfill, and that is stressful to say the least! I know many of you reading this can identify with this feeling. But friends, let me tell you something I’ve learned: when you are feeling like too much is being asked of you, you might just find, as I have, that the person doing too much asking is yourself. Here’s an example for you: this week I’ve been majorly stressing over a dessert I needed to provide for an event. How in the world was I going to find the time to find the perfect Pinterest-worthy recipe, make sure that I get it just right on the first try and then wow the crowd with its insanely awesome taste and look? But when I sat down to really think it all through, I realized that the only person who was asking me to do all of those things was me. I really didn’t have time to create a new dessert from scratch this week, and so I gave myself permission to let the grocery store do the baking for me. I could provide a homemade topping that would take the flavor profile up a notch and save my sanity all at once. 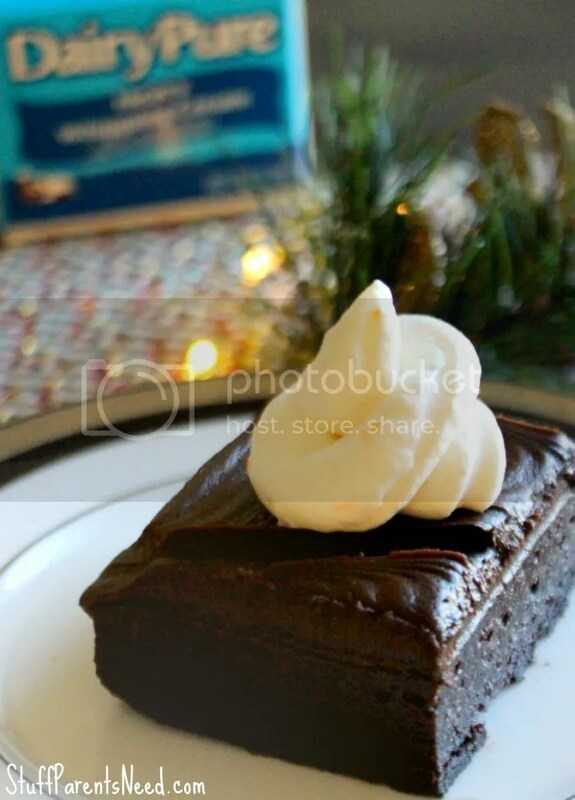 So as a compliment to these store bought chocolate goodies I purchased, I made an AWESOME whipped topping. It only takes a few ingredients and a few minutes and it tastes extraordinary. 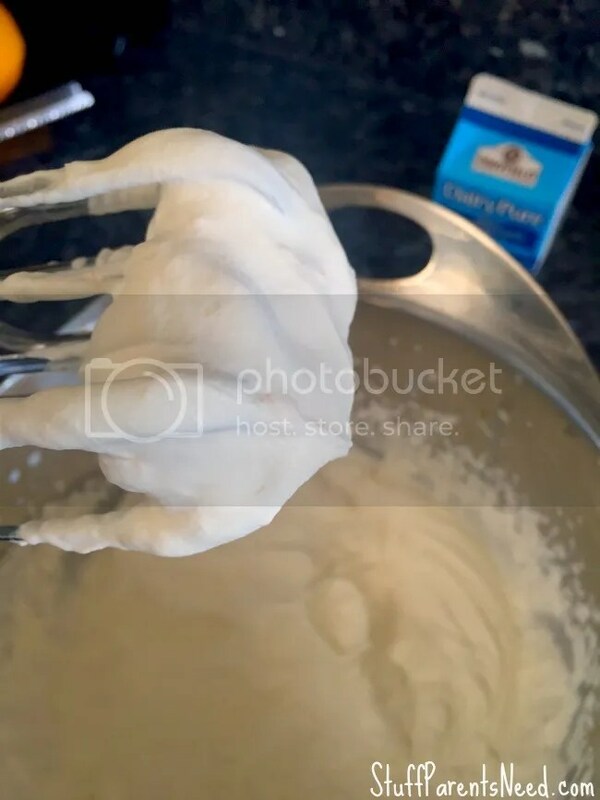 I hope you enjoy this simple and delicious recipe for Orange Blossom Whipped Cream. 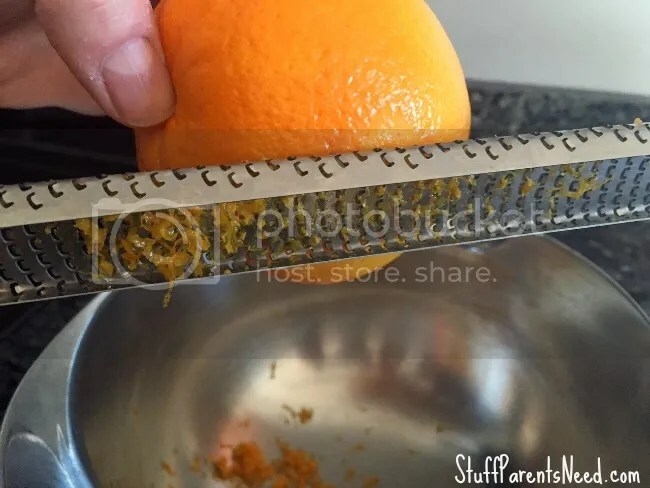 Begin by grating your orange peel using a zester. This adds such great flavor and a bit of color to the recipe. If you don’t own a microplane zester, this is the one to get that will go the distance. I’ve had mine for a decade and it still works amazingly well. 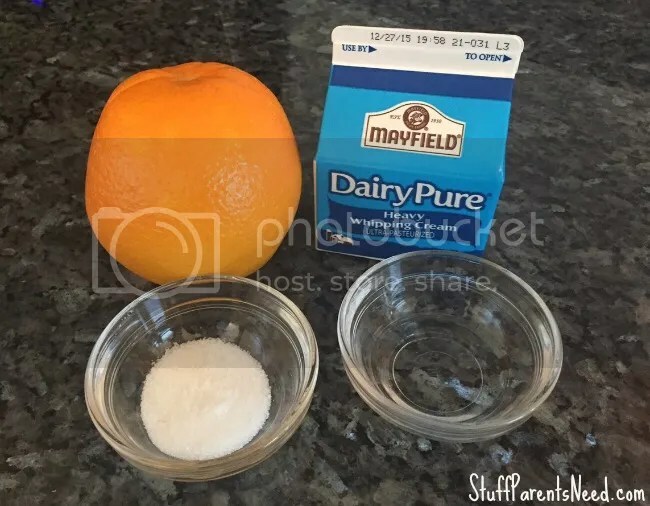 Add all the remaining ingredients together with the orange zest in a mixing bowl and then mix on the highest setting of your mixer until stiff peaks are formed. When the mixture is getting close to forming those peaks, give it a taste to see if the sweetness is to your liking. You can add a bit more sugar at this point if you desire. Now all you need to do is add this to your dessert of choice! Yum!!! Thanks to Stouffer’s and The Motherhood for partnering with me for today’s post on balanced meals. As always, all thoughts and opinions are mine alone. My budget is weighing heavily on my mind this time of year. I have a large extended that I buy gifts for (and it’s a joy to get to do…gifts are my love language) and this month I’m buying most of those gifts. I have some money set aside for Christmas, but I also need to get very resourceful with my monthly working budget, and figure out some ways to pinch pennies. One of the ways that I do that is by getting creative in the kitchen to use up as much food that’s already in the house as I can, since that food has already been purchased. A few days ago, for example, I did our weekly grocery shopping, and I only bought milk, eggs, and fresh fruits and veggies that were on sale. Everything else we are going to be eating this week is coming from the fridge, freezer or pantry. Most people are spending more than usual this month and next, so if this budget crunch rings true for you, I want to encourage you to think about your family’s meals in the coming weeks in a different way. With a bit of creativity, you can create a balanced meal that offers great nutrition and is really affordable (and you can clear out some space for those big holiday meals, too!). Let me show you what I did! One of the treasures you will typically find in my deep freeze is a frozen lasagna. I love the Stouffer’s Family-Size Lasagna with Meat & Sauce, as this particular product has saved me on more than one occasion when we had company coming over and I didn’t have time to run to the grocery store before they arrived, or when my own family wanted a deeply satisfying meal (isn’t lasagna SO good?) and mama was just too short on time to make one. I paired the Stouffer’s lasagna with brussels spouts and pulled together something fantastic (I promise! Don’t give up on brussels sprouts!). While the oven is heating, go ahead and cut your brussels sprouts into fourths. Coat the sprouts with the olive oil, then place them on a foil lined baking sheet and roast for approximately 20 minutes, stirring around after 10 minutes. You’ll want them to have spots of dark coloring on them. While the sprouts are roasting, prepare your bacon to your liking. I personally also bake my bacon in the oven, so I just lay them out on a foil lined sheet and let them cook at the same time as the sprouts (they need about 17 minutes). Once your sprouts and your bacon are cooked, it’s time to prepare your oven for the lasagna. Be sure to follow the package instructions (spoiler alert, they are SIMPLE!). While the lasagna is cooking, you can build your salad by combining the sprouts with crumbled bacon and with the other toppings (as desired). Drizzle the salad with a bit more olive oil, if desired, as well as with the maple syrup, and then stir to combine well. This salad tastes great warm or cold. When roasted, brussels sprouts becoming a magical vegetable that my kiddos DEVOUR! And as for the lasagna? My oldest, who professes to not like meat at all, ate it up in record time! Nestle (Stouffer’s parent company) has a great set of resources available that are all about helping you offer balanced meals to your family. The Balance Your Plate initiative aims to help you build nutritious, delicious and convenient meals for your family. Be sure to check it out! I hope you will join me and my friends at Stouffer’s and The Motherhood on November 19th at 1pm ET for a Twitter party all about the Balance Your Plate Initiative. 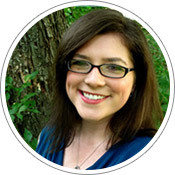 You’ll get some great tips for meal planning, being budget conscious and more! And of course, there will be prizes (FIVE $25 Visa gift cards, which will be SO nice for your holiday budget!)! RSVP here! What are some of your “creative” meal ideas for when you need to make use of what you already have on hand while keeping a balanced plate in mind? Spiced Holiday Drink with 7UP TEN: A Quick, Elegant Beverage! Friends, as you start to collect ideas for your Thanksgiving feast this year, please don’t forget the drinks! It’s an area I often overlook because sophisticated drinks tend to take quite a bit of time to pull together, not to mention the fact that I’ll be ingesting plenty of calories on Thanksgiving Day, so I’d rather limit the calories I add by way of a drink. Do you feel similarly? If so, I want to encourage you to think about offering a different option this year to your guests (or if you are a guest, offering to take this on for the host and hostess!). I have created a special mocktail that I think is just perfect for Thanksgiving. It will wow your crowd without taking much of your time, and it’s free of alcohol! Additionally, since I’m using a TEN™ soda variety (which only have 10 calories per serving) you can trust that nobody will get too full from the drink alone. Heat 4 star anise and a heaping tablespoon of pink peppercorns over medium-high heat in a small saucepan for 3 minutes, stirring often. Use some of your broken star anise for this part of the recipe and save your fully intact pieces for later! Now reduce the heat to medium and add the water to the pan and allow the water to reduce roughly by half. This took 5 minutes for me. Remove the liquid from the heat and then remove the peppercorns and star anise either with a strainer or a slotted spoon. Now add the honey and stir until the honey is completely mixed with the water. This took about 30 seconds for me. Once the honey and water are well combined, pour the simple syrup you just made into a container, and add a sprig of thyme to it. At this time you should also add roughly 1 Tbsp of lemon juice to the mixture. Give it a good stir and allow it to cool down for a few minutes. Remove the sprig of thyme prior to serving. To the bottom of each glass, add 2 Tbsp of the honey mixture. Then add a few ice cubes, and fill the remainder of the way with 7UP TEN®. Garnish each drink with a slice of lemon on the rim, a sprinkle of pink peppercorns, 1 whole star anise, and a few sprigs of thyme. I hope you love the great taste of this spiced holiday drink, and I hope the crowd you serve it to is dazzled by its beauty, and overjoyed by its humble calorie count thanks to 7UP TEN®. Cheers! Great news, friends! Now you can save $1 on TWO (2) 2-Liter bottles of 7UP TEN®, A&W TEN®, Canada Dry TEN®, RC TEN®, Squirt TEN™, or Sunkist® TEN™ You can find the savings here. A great place to pick them up is your nearest Walmart. I found several TEN products on the shelves when I was there earlier this week. Don’t forget to vote for your favorite TEN recipe and check out these awesome beverage recipes to get more great ideas. Which one would you most like to serve at your holiday gathering? 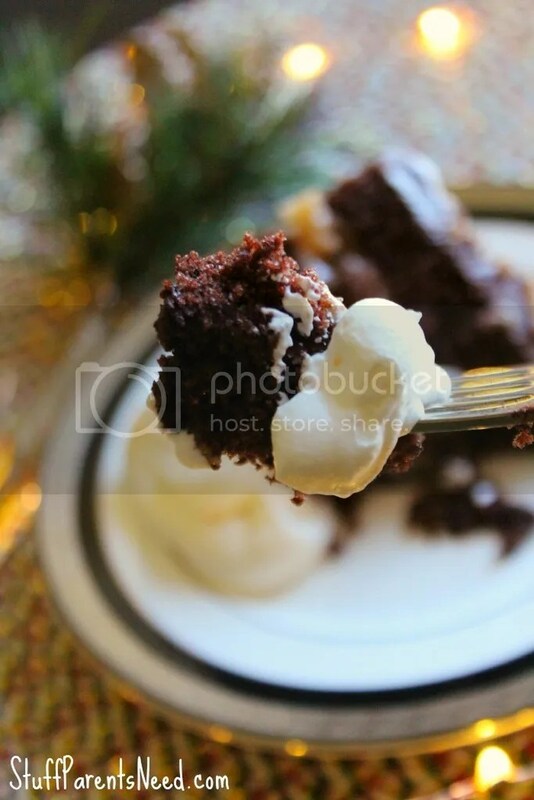 Do you have holiday baking on the brain, yet? I’m stalking Pinterest like it’s my job for fun treat ideas to make with my kids for Halloween, Dia de los Muertos, Thanksgiving, Christmas, and should there be any random dessert holidays in between now and then (National Chocolate Day, anyone?) I’m all over it. If I make it, I control the ingredients. I don’t have to worry that preservatives were added to make it shelf stable. I don’t have to wonder about the quality of the milk (since we all know I’ll be rockin’ the DairyPure, which is my family’s choice for dairy), and I can choose the type of sweetener (for me, that means I’ll pass on that highly processed white stuff and will go for something a little more natural, as well as something organic). The main thing I learned about how to make condensed milk during my weekend experiment was that it is super easy, but does take quite a long time. So it’s definitely a weekend project, or something to tackle any time you know you will be home and also awake for 3-4 hours. But the good news is that it will take precious little of your attention during that time. 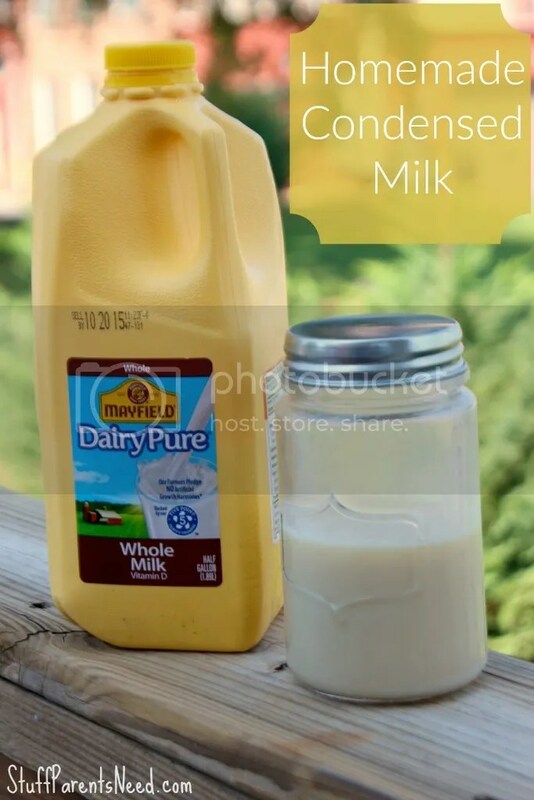 Let’s dig in and learn together how to make condensed milk! No artificial growth hormones (no significant difference has been shown between milk derived from cows treated with the artificial growth hormone rbST and non‐rbST‐treated cows). 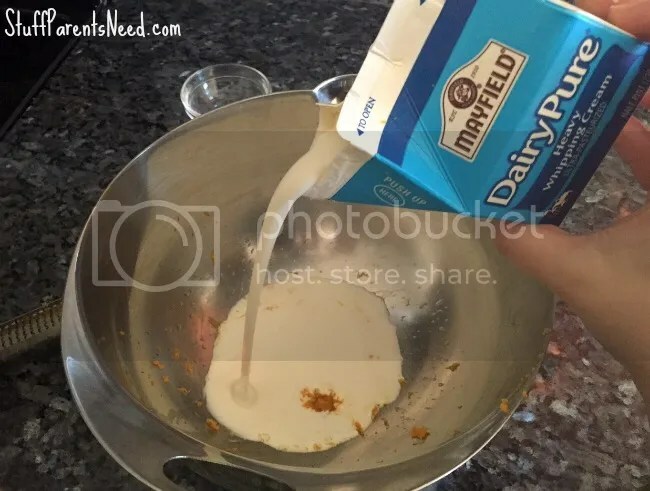 Take 2 cups of DairyPure whole milk and add it to a saucepan on medium heat. 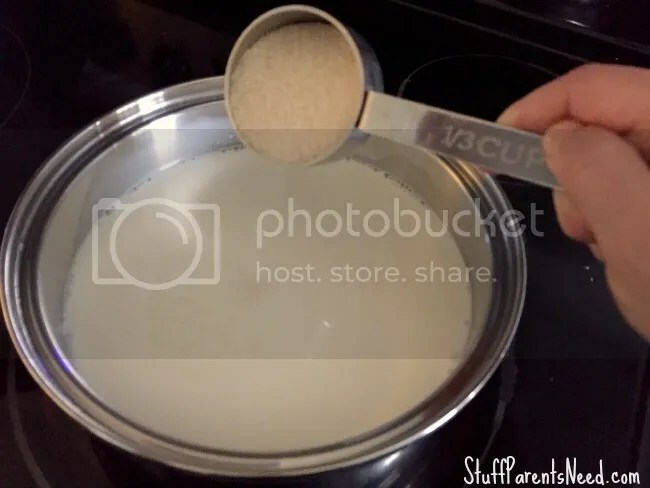 Now add 2/3 cup of your chosen sweetener, and stir constantly util the sweetner has dissolved into the milk. Continue stirring until you notice the milk just starting to steam. Now turn the burner to its lowest setting and let it reduce by half, stirring occasionally (I stirred maybe every 15 minutes or so). I found this process to take 3 hours and 15 minutes. 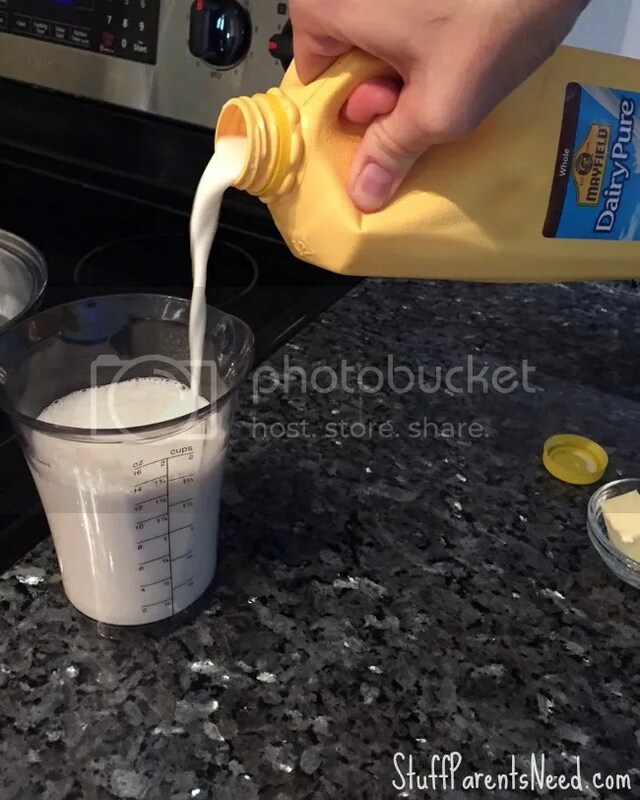 I checked to see how much the milk mixture was reduced by simply by pouring it back into the measuring cup. 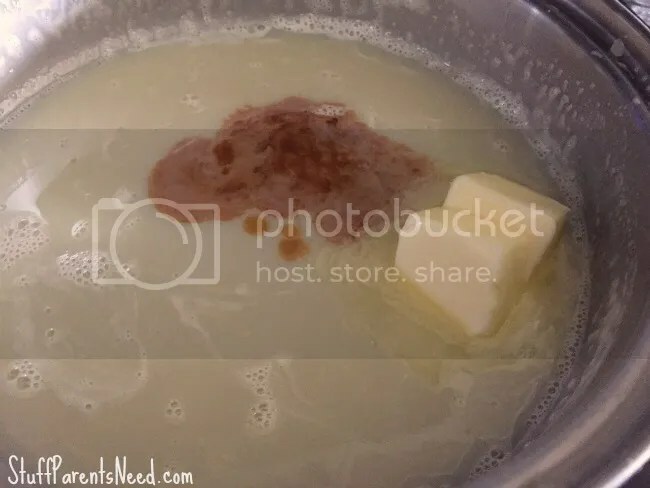 Once your milk mixture is down to about 1 cup in measurement, it’s time to turn off the burner and add the butter and vanilla extract, whisking constatly until well combined. 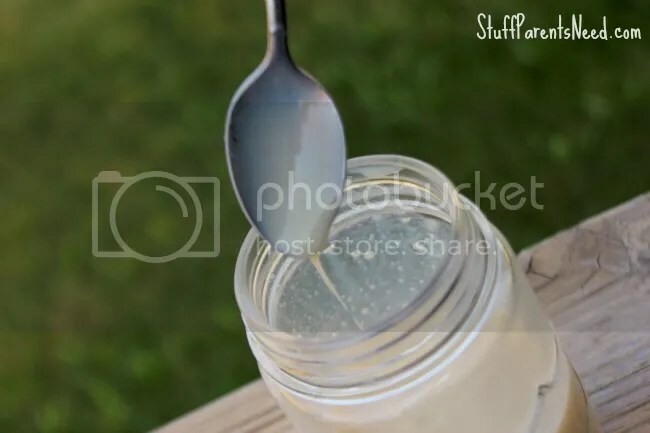 Now pour the contents into a glass jar with a lid and allow to cool. I can’t say for certain how long this will stay good in the refrigerator, but I would aim to use it up within a few days just to be safe. You might notice that your final product seems a bit runnier than the store bought version. It will thicken as it cools, though I found the end product to still be a bit thinner than what I was expecting. However, I did use it in a recipe and had excellent results. You could also let the milk reduce by more than half, though, if you really want it to be thick. If you want to Learn more about DairyPure check out the website for details and for your nearest provider. 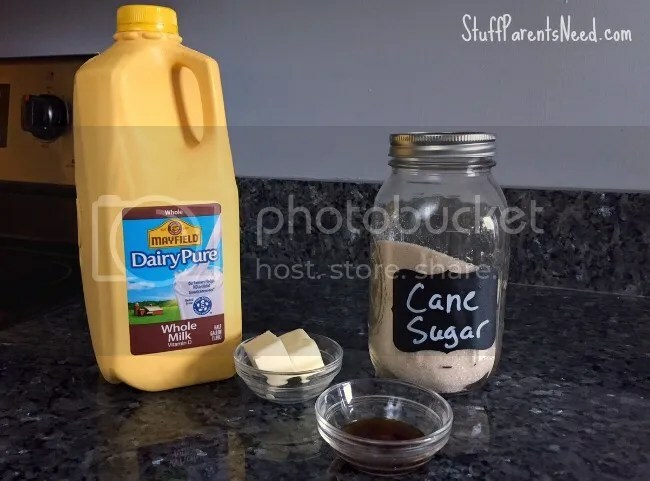 And before you get all your holiday bakign planned out, be sure to look through the DairyPure Recipe inspiration on Pinterest, and follow DairyPure on Facebook for all the latest tips and ideas. When I find a particular food (especially veggies) that my girls will both happily eat, I try to figure out as many ways as humanly possible to offer it to them. Today’s super yummy recipe is inspired by the fact that both of my girls seem to enjoy butternut squash, both love pot pies, and both love bacon (but then again, who doesn’t love bacon?!). And as the chef, I like to keep my ingredient list to a minimum, so you’ll only find 6 ingredients in this recipe for a Flaky Crust Butternut Squash Pot Pie. Six ingredients is crazy, because pot pies I’ve made before have easily had 15 ingredients in them. Nobody has time for that mess during the holiday season which has most definitely begun, like it or not! Let’s put this awesome dish together so you can see how to make it for your crew. It’s absolutely perfect for some of those first chilly nights that are starting to happen all over the country. I found all the ingredients I needed all thanks to one stop at Walmart. To begin, preheat your oven to 400 degrees and line 2 baking trays with aluminum foil. Add your bacon to the 2 trays, and once the oven is preheated, pop the trays in the oven for 15-17 minutes. Meanwhile, peel your butternut squash and cut into bite-size pieces. If you are wondering about quantity, mine totaled right around 6 cups once diced. I chose to steam my cubed butternut squash on the stove top in two batches for 7 minutes per batch. You could also steam your squash in the microwave if you prefer. While your squash is steaming, your bacon should be cooked. Once you are able to safely touch the slices, move them to a plate lined with paper towels to help remove excess grease. As for the bacon grease on the trays, let’s use it to add some awesome flavor to the veggies! Pour it into a large saute pan and turn the burner on to medium heat. Now it’s time to cut the mushrooms to your liking. I put heaping 2 cups worth of diced mushrooms into this recipe. Once your bacon greased is warmed up, add your mushrooms and let them cook for 1 minute before adding all of your steamed squash. Cook the two veggies together in the bacon grease for another 2 minutes. While your veggies are cooking, chop up your bacon. I use a pair of kitchen shears to get them cut into small pieces fast. Now it’s time to add the cream of mushroom soup and the bacon to your sauteed vegetables. Go ahead and turn off the heat on the stove but leave the pan on the eye after you’ve mixed everything together. Give your deep dish pie pan (or your cake pan, which is what I used!) a quick spritz with cooking spray and add the Pillsbury pie crust. Pour the contents of your saute pan on top. Now for the fun part! Open your Pillsbury Crescents and add them to the top, piece by piece. Remember, pot pies are meant to have a rustic look, so don’t stress out trying to make everything look perfect! Put your pot pie on a lower rack of your oven an bake it at 375 for 15-20 minutes, depending on how brown you’d like for your crust to be. Once it is done allow to cool for about 10 minutes before serving. Enjoy! For my family, this recipe was a huge winner because it contained elements that everyone loved. My girls are notorious for asking for a completely different food item for their second helping at dinner (cereal, a pbj sandwich, etc.) so when they both asked for seconds of this pot pie, I knew I hit it out of the park! Great Start Waffles: A Portable Breakfast Made in Minutes! We are 3 1/2 weeks into the school year already (I know! I’m still seeing “first day of school” picks this week from my friends in the northeast!). And I have to tell you, I’ve learned a few things about getting these kiddos out the door without mom and dad getting more gray hairs in the process. The most important thing I’ve learned is that it takes some advanced planning to not lose your mind. But here’s the good news: that advanced planning doesn’t have to mean that you just do all the work the night before and stay up late grumbling (been there, done that while making overnight oatmeal). You can plan strategically to include steps in your morning routine that make your life easier, I promise! Breakfast is one of those areas where, with just a little forethought, you can provide a very filling, protein-packed breakfast that will get your kids off to the right start (and that they will actually eat! Anyone else’s kids turn their noses up at the sight of scrambled eggs?). Today I want to show you one of my girls’ very favorite breakfasts. It’s one of my favorites, too, because it’s easy to pull off on busy weekday mornings. I call it Great Start Waffles. Begin by toasting your Eggo waffles to your desired crispness. While the waffles are toasting, in a small bowl combine the syrup and the peanut butter together. To make the peanut butter cooperate with the syrup and blend well, first heat up your tablespoon of peanut butter in a small microwavable-safe container for 10 seconds. The final consistency will still be thick, and that’s a good thing, because by combining your peanut butter and your syrup together like this, you’ve decreased the probability of having syrup spillovers! If you haven’t yet sliced your banana, do so now, as well. Once your waffle is toasted, remove it (carefully! It’s hot!) and apply the syrup peanut butter mixture. Add bananas on top and serve. Your child can simply pick it up and eat it like a piece of toast and get on the move if it’s time to go! This recipe scales beautifully, so just double, triple or even quadruple it for the size group you need to feed. And if you have hungry teenagers in the house, turn the recipe into a sandwich by adding more peanut butter mixture and a second Eggo waffle on top! I found everything I needed to make this recipe at my local Target. Did you know they have an entire section of their freezer devoted to waffles? Just one more reason to love that place, I tell ya! The next time you visit the home of the bullseye, be sure to check out Kellogg’s Back to School packaging on great on-pack offers in store at Target. Do you have any easy morning recipes or other tips that help you get your family out the door without stress?